Senna continues a recent trend towards giving real-life stories in sports the treatment of a feature documentary. With the recent HBO Sports docs playing at festivals and on pay cable, and the great ESPN 30 for 30 series, people have finally started to realize that looking back at sports with a journalistic and artistic eye will produce cinematic experiences far and above what can be done with good old-fashioned fiction. Why reinvent the wheel when sports by their very nature feature dramatic characters going through immense physical and emotional stress that pushes their bodies to the limit, often putting themselves in danger? Add to that the fact that all of these great dramatic moments have already been captured on film/video. Senna, as a documentary feature, is no exception. Asif Kapadia’s film brings us back to arguably some of the most exciting years of Formula One racing between 1984-1994. These were the years of Alain Prost and Ayrton Senna, one of the great rivalries in the history of sports featuring two personalities in the big money, high stakes arena of Formula One. Senna chronicles this decade-long journey of the humble Brazilian’s rise to become the best driver in the world, one of the best ever, pushed by his teammate and fierce competitor, Frenchman Alain Prost, to create a sympathetic and deeply tragic study of a man fighting battles on and off the racetrack toward a tragic destiny. Senna is a deeply moving and emotionally affecting character study. Kapadia is surprisingly lean with his information, certainly not wasting time getting into things. With as little time as possible dwelling on Senna’s childhood or upbringing, we're almost immediately thrown into his rookie season in Formula One – off to the races if you will. The stylistic hook at play here is the exclusive use of stock footage through which Kapadia tells his story. The footage is fantastic. Even the lesser quality ‘80s and ‘90s video, which threatens to subvert the big screen polish of the film, is given a clever filter treatment that translates to a nostalgic feel for the era. What this means is that we never see the interviewed colleagues and journalists we hear providing the commentary. We also never see any of Senna’s private life. Like the tunnel vision of a racer on the track, Kapadia lasers in confidently on Senna’s racing career from the media’s point of view. It’s an admirable self-imposed challenge, but we also miss out on the reactions of, say, his dear friend and F1 doctor Sid Watkins reacting to Kapadia’s questions. Same with Alain Prost – other than the media interviews at the time, we don’t ever hear from him until the end of the film. The lingering effect of the film, though, is the remarkable face of Senna. The cameras capture through Senna’s eyes enormous humility, grace and honour. After spending an hour-and-a-half watching him in competition, with his family and simply reacting to the cacophony of media attention on him, even though we know he dies, it’s a truly heartbreaking moment. Though I rarely advise learning about a subject before watching a film, knowing how and when Senna dies at the end of the movie adds a level of intensity and tragic destiny to the experience. Every moment of jubilation is tempered by the sad knowledge of Senna’s ultimate fate. The moments just before Senna’s death on that day in San Marino will rip your heart out. Kapadia holds dramatically on an on-board camera shot from Senna’s car, a frequently used camera angle in this film that creates a unique kind of personal intensity we don’t get from a regular Formula One broadcast. The sheer length of time for which Kapadia holds the shot sets us up for what we all know was coming as soon as we started watching the film. Leaving the theatre, the tragedy lingered in my mind longer than most other film experiences, even some of the best movies I’ve ever seen. 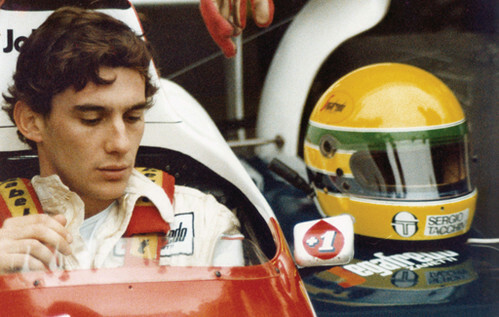 Thus, Senna triumphs as a legacy for the great racer and as a sports documentary in general.